Have fun trying to decipher MailPop Pro’s icons. The program won’t give you any hints. MailPop Pro for Gmail (Mac App Store only) cheerfully fulfills all the functions of a lightweight Gmail client. But it also adds little to distinguish itself from a passel of similar rivals—which makes its few negative differences stand out even more. Since MailPop Pro connects directly to Gmail, setup’s a snap—username, password, and you’re all set. You may have to enter a one-time numerical code, but you won’t need to create an application-specific password. 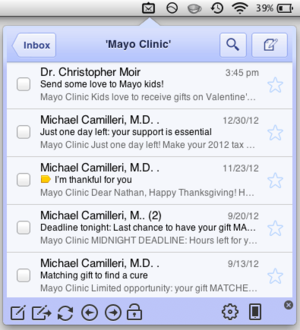 Once logged in, you can send and read your mail the same way you would from your mobile device. The compose message button only seems to work when in your inbox or another mailbox listing, not from individual messages or threads. 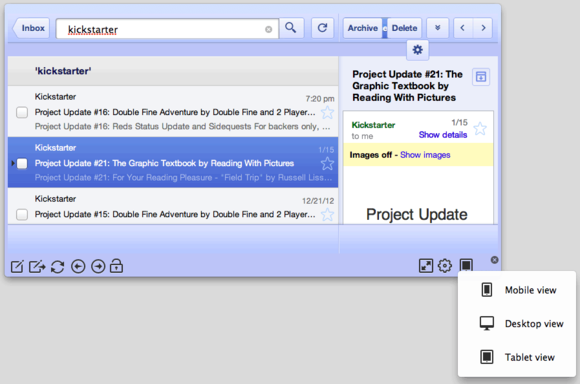 The adjacent “compose message in new window” button still works, though. Gmail’s drawing features seem broken here, as they are in similar clients. MailPop Pro creates a popdown window accessible from an icon on your menubar. There’s no option to break this off as a separate window in the mobile view, as in similar programs, but I found the popdown more useful anyway. Desktop and Tablet layouts appeared only in a separate window, with no popdown option. The desktop and tablet views only come in standalone windows, while mobile view’s only available as a handy popdown menu. As with other slim front ends for Gmail, routing through Google’s servers can occasionally slow down MailPop Pro, especially on launch. But MailPop Pro gives you only a tiny, blink-and-you’ll miss it indicator at the bottom of the window that it’s loading anything—leaving a big, blank window staring at you just long enough to make you start wondering whether the program has hit a glitch. 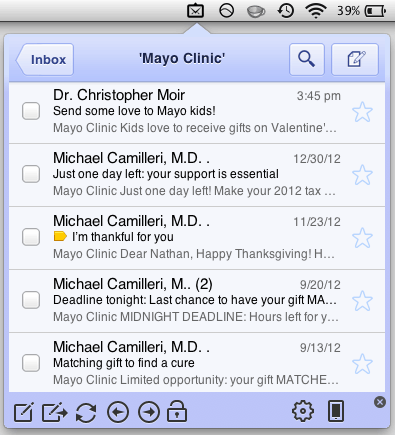 MailPop Pro misses other subtle cues like this. The puzzling icons at the bottom of its window have no explanatory tooltips, and the Usage Tips window you’ll find listed under the Settings menu doesn’t explain them, either. It took a bit of trial and error before I figured out that the lock icon kept the window in view even when I clicked away from it. 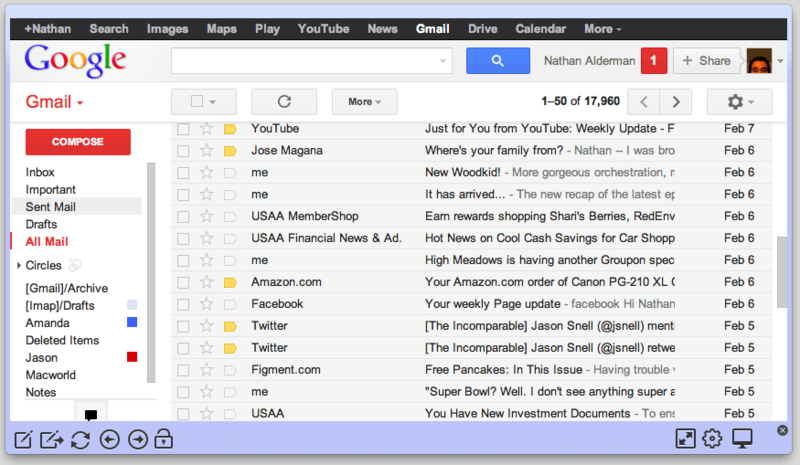 I wasn’t the biggest fan of MailPop Pro’s drab, monochromatic interface, either. Tablet view is supported, but doesn’t render exactly right. Thankfully, other views are just an easy click away. Though it lacks the desktop-replacement ability I enjoyed in its rival Email Pro for Gmail ( ), MailPop Pro does have a few features absent from that competitor. It provides keyboard shortcuts, plus a button to easily switch between mobile, desktop, and tablet view—though the latter didn’t quite render correctly for me. Though it’s highly similar to other programs in its class, MailPop Pro’s admittedly minor shortcomings still left me nonplussed. Unless you need keyboard shortcuts, you can find the same features within friendlier interfaces, for even less than MailPop Pro’s $3 price.